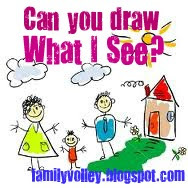 Family Volley: FAMILY FUN FRIDAY-Can You Draw What I See? FAMILY FUN FRIDAY-Can You Draw What I See? To have a person draw a picture YOU see, by explaining to them how to draw it. Get your picture ready. You don't want it to be too complicated. Especially your first few times playing. Choose one person in your family to be the artist. Have the artist face the rest of the family. Make sure that the artist cannot see the picture, just the family members. We like to hang the picture on the wall behind the artist's head so that everyone can see it, except them. The family will now look at the picture and tell the artist how to draw the picture. The family is not allowed to help draw the picture in any way and can only explain what it looks like. No pointing or touching the paper either. The artist listens and tries to draw what they are being told. In the end, reveal the picture that was drawn and compare it to the actual picture and see how well the family and artist did. This is a powerful family activity! A great activity to work on communication and better understand family dynamics. Play, and you will see how your family works together, communicates and relates to one another. You will see that some family members communicate better than others. You will see some family members take leadership roles. You will have lots of fun too. Sounds like a fun game! I might incorporate that into my homeschooling sometime soon. I'm visiting from the UBP 2012. I don't know how you come up with all these amazing ideas but I'm glad you share them. What a fun activity. I remember doing something similar in high school. My oldest would love this game. Thanks for the reminder! Hi, stopping by from UBP. Fun activity! Thanks for sharing. I'm visiting from UBP 12.